A five-point strategy has been developed to support local communities in Ghana to conserve forests, mitigate climate change and sustain livelihoods. The strategies include fire prevention and control, establishment of plantations, agro-forestry, education and awareness creation, and provision of sustainable livelihood support systems. Researchers at the Forestry Research Institute of Ghana (FORIG) have, in the past one year, engaged interest groups in the Offinso Forest District of Ashanti to deliberate and agree on the strategies and action plan. The intervention is under study titled: “Strengthening Capacity for Reducing Deforestation and Forest Degradation and Enhancing Environmental Services from Forests (REDDES)”. Project Coordinator, Dr. Ernest Foli, says adoption and implementation of the strategies, scheduled to take off from 2014, would help reverse deforestation and degradation as well as help mitigate the impact of climate change. The study outcomes come on the heels of the landmark report by the UN's climate panel that confirms climate change is caused by human emissions. There is compelling evidence in Ghana to give credence to the report, says Dr. Foli, who heads the Ecosystem Services and Climate Change Unit of FORIG-CSIR and serves on the National Climate Change Committee. “People here have agreed that the lost of forest is as a result of activities like illegal chainsaw milling, unsustainable agriculture, bushfires and other anthropogenic activities caused by human beings”, he observed. “And if the forest cover is lost it means the capacity to reduce emission is also lost because the forest has also proven to be a carbon sink”. The aim of the REDDES study is to build capacity of African countries – Ghana, Nigeria, Liberia and Cameroon – to generate and disseminate information on reducing deforestation to stakeholders, especially policy makers and local communities. The project is spearheaded by the International Union of Forest Research Organizations (IUFRO), the Forestry Research Network of Sub-saharan Africa (FORNESSA) and the International Tropical Timber Organization (ITTO). Forestry Officer at Offinso, Michael Sarpong, is confident the strategy would be effective when implemented due to the direct involvement of local people in the formulation process. “The communities play very crucial role in the management of the resource and we have neglected them for some years now; it is them who normally go to the reserve and carry on illegal activities. So when we bring them on board and educate them about the need to protect the reserve, we believe it will go a long way to protect the forest reserve,” he said. Advanced economies are believed to be causing the greatest part of global warming. But people in developing countries are most vulnerable. “Whilst we are vulnerable and we don’t even have the resources to cope, it makes it sensible for us to take steps that, at least, at the local level we don’t deplete the forest so that we can get rain and when the rains come, they are moderated”, noted Dr. Foli. Meanwhile, Ghana has secured a $9.75 million Climate Investment Fund (CIF) to undertake a forestry programme that generates financial and environment benefits to local communities. 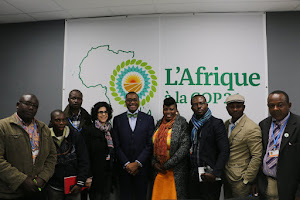 The African Development Bank (AfDB) supported the country to access the fund under the CIF’s Forest Investment Programme (FIP). The funds will enable Ghana to undertake REDD+ projects in local communities and the enhancement of carbon stocks (ELCIR+) project which will help reduce deforestation and forest degradation.